Ferndale cares for your pet throughout their entire stay with us. All of our staff are very experienced animal lovers. We can also provide daily veterinary attendance should our guests require it. 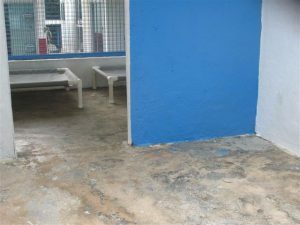 We have 33 individual kennels for large, medium and small dogs (A/C or Fan options) and 30 air-conditioned indoor condos for cats. Owners of more than one pet may board them together, although dogs and cats must be boarded separately. Each dog has his/her own run and never comes in direct contact with any other dog unless specifically requested. 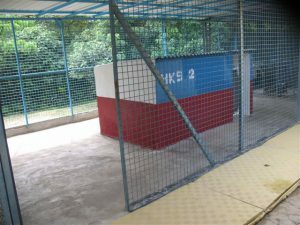 Our individual kennels all have an indoor sleeping area and an outside runs which the dogs can move freely in day and night. All the inside areas have summerwinds beds which are raised off the floor to ensure the dogs can rest in comfort and watch the other dogs play in our garden. 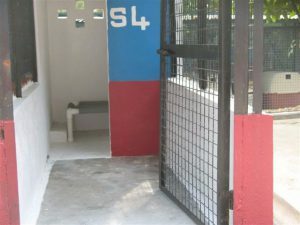 During the day the dogs can come out of their kennels a number of times to play by themselves or if pre-arranged they can have some group playtime too. Dogs have to be assessed before they can join in with our group playtime. 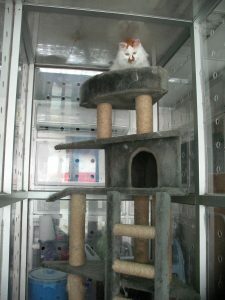 Our modern indoor air-conditioned cattery offers the cats three level comfort. 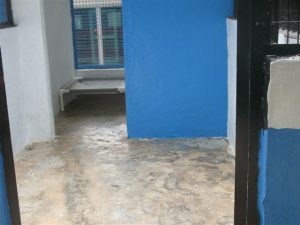 The top floor consists of a enclosed quiet room with a bed, then our residents may come down a level through their own peep hole to the lounging shelf below, and then onto the ground floor which has a litter box and dining area. If any of our residents come with a friend they can have adjoining condos, giving them double the space. Our residents once settled get to exercise daily in our purpose built gym with hidey holes, a covered litter tray, dining area and scratching/climbing posts. 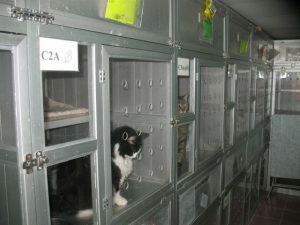 No where in our cattery will you find any bars or wire netting. Animals boarding with us are regularly brushed and combed. For certain breeds however, such as Old English Sheepdogs, Afghan Hounds, Pomeranians, Persians, Himalayans, etc. an additional charge will be made. We recommend where possible during summer boarding long haired dog breeds are cut short, we can provide this service for you if required. We provide a pick up and delivery service to all parts of Hong Kong Island and Kowloon, which is priced according to the distance involved. Clients living on the out-lying Islands can be met at the appropriate Ferry Pier. We have no pet pick-up service on Weekends or Public holidays, although special arrangements may be made under some circumstances with an extra charge added. 1) What veterinarian / animal doctor do you use? 1) Special needs or diet? 2) What veterinarian / animal doctor do you use? 2) Special needs or diet? 3) What veterinarian / animal doctor do you use? 3) Special needs or diet? 4) What veterinarian / animal doctor do you use? 4) Special needs or diet? 5) What veterinarian / animal doctor do you use? 5) Special needs or diet?